I made this dish for our dinner last week. Tender pan fried chicken breast cooked in brined peppercorn sauce. This sauce is much lighter than the usual peppercorns sauce served at the restaurant. I used some white wine for the sauce but you can always replace it with chicken stock. Because preserved green peppercorns quickly lose their flavor in cooking, add them at the end. This sauce is also delicious with fish, steak or duck. 1. Heat a large non-stick pan over medium high. Season the chicken with some salt and pepper. Lightly coat the chicken with flour and set it aside. 2. Melt 2 tbsp of butter and a tbsp of olive oil, then add in the chicken and sear until golden on both side. Remove from pan and set it aside. 3. In the same pan, add another tbsp of olive oil, add in garlic and sauté until fragrant. Add in red peppers and white wine, stir to scrape up brown bits from the bottom of the pan. Add in stock, bring up to a boil and cook until the sauce reduced by half. 4. Put the chicken back into the pan, add in the green peppercorns, salt and pepper to taste. Once the chicken is well coated with the sauce and sauce thicken turn off the heat. Dish out and serve. Note: If you like thicker and heavier sauce you can always add some fresh cream to the sauce. I love cheese crackers especially Cheez-It I can eat it just like that or even put it in my soup. Why bake my own cheese crackers when I can just buy a box of it? Well, I simply like the idea that I am able to bake something I like to eat and also it’s much healthier without all the preservatives. These homemade cheese crackers are the most tender, rich, buttery, cheesy crackers you have ever eaten. It involves very little fuss. Just put everything in the food processor, roll out the dough, cut it and then bake it. 1. Preheat your oven to 325 degree F. Line a baking sheet with some parchment paper. 2. Put all the above ingredients except water in a food processor. Pulse until it resembles coarse bread crumbs. Slowly add in one tbsp of cold water or a bit more until the mixture comes together into a ball. 3. Take out the dough and lightly floured work surface, give the dough a few knead and let it rest for half an hour. Remove the baking pan from the oven, and transfer the browned crackers to a cooling rack. This tasty chicken patties, also know as Tsukune in Japanese. Come in round, oval-shaped or shape into meat patties. You might find some grill and serve in skewer and some serve in a thick layer of caramelized teriyaki sauce. Made from mixing ground chicken meat witha few other ingredients. Tsukune can be fried, simmered, or grilled. Tsukune is tender and juicy, bursting with flavor with every bite. 1. Put ground chicken in a bowl. Add egg yolk, salt, soy sauce, fresh ginger juice and cornstarch in the meat. Mix well. 2. Shape into meat patties. In a non-stick pan heat up some vegetable oil. Pan fried the meat patties on low medium heat for 2-3 minutes on each side. 3. Remove fried tsukune from the pan and drain oil on paper towels. Remove the remaining oil from the frying pan. 4. Put in all the sauce ingredients in the pan. Bring it up to boil and once its boil put in the tsukune. Simmer until the sauce thickens and almost dry. Remove and serve with warm rice. The heat is already looming around here in PA so it really does feel like summer. I wanted to bake something tropical and also to get rid of a can of crushed pineapple from my pantry so I bake this great cake to start the summer. A layer of moist cake on the bottom and topped with a layer a gooey buttery pineapple and crunchy caramelized walnuts. 1. Pre-heat over to 350 degree F. Greased an 8” x 8” square baking pan and line it with parchment paper overhang on both side (for easy removing your slices later). 3. Sift flour, baking powder and salt. Add the flour into the butter mixture and the milk. Mix well. 4. Spread the mixture evenly into the baking pan and bake the cake for 30 minutes or until lightly brown. Cool the cake for 15 minutes. 5. Pre-heat the grill/broiler to high. To make the pineapple topping, cream butter and brown sugar until just combined. 6. Stir in the well drained pineapple and walnuts. Mix well. Spread the topping over the cake base. 7. Grill the cake for 5-7 minutes or until the topping bubbles and caramelized. Cool the cake before cutting. Note: Drain the pineapple really well if not it will make the cake base soggy. Prepared the topping only when the cake is done if not the pineapple topping might discharge more liquid. I am a fan of Pillsbury products especially their breadsticks. I used it for to make Blueberry Cream Cheese Loaf, cheese sticks or garlic bread. For today I made Cinnamon twist out of it. These twists are great for breakfast or afternoon tea. All it takes it just 15 minutes to put it together and another 15-20 minutes to bake and you will have freshly bake twist with your morning coffee or afternoon tea. 1. Preheat oven to 375 degree F. Line a baking sheet with parchment paper. 2. Combine sugar and cinnamon on a plate. Mix well. Beat the egg in a small bowl. 3. Take out the breadsticks dough from the tube, unroll it and separate the dough. Take a strip of the dough, brush it with egg on both side of the dough and then roll it in the cinnamon sugar. Take both ends of the dough and twist it. 4. Place the twist on the baking sheet. Do the same to the rest of the bread dough. 5. Bake for 15-20 minutes or until golden brown. Note: you could do any number of different flavors with the breadsticks like spreading it with nutella, fruit jam, sprinkle it with cheese - the possibilities are endless. I prepared this Mexican style lunch last week. These chicken strips and chunky vegetable is all cook in a hot pan. Once cooked, serve it with warm tortillas, spicy salsa, guacamole, grated cheese, and pickle green chilies. 1. In a large mixing bowl combine the chili powder with the salt, cumin, onion powder, garlic powder, cornstarch, water and 2 tablespoons of the oil. Add the chicken, bell pepper and onion. Toss well and let it marinate for 15 minutes. 2. Heat the remaining 1 tablespoon of oil in a large nonstick skillet until shimmering. Put in the marinated ingredients and cook it over high heat, stirring occasionally, until the vegetables are crisp-tender and the chicken is cooked through. Remove from the heat and stir in the lime juice. 3. Transfer the chicken and vegetables to a plate and serve with the warmed tortillas. Chicken parmesan is Italian comfort food for me. For years I’ve been making this dish. Not authentically Italian as we didn’t server with spaghetti but we will have it with salad or with bread. My version is much simpler and I serve the marinara sauce on the side. The key ingredients to this dish is the flavorful breading and the flavor of parmesan cheese is the magic ingredient that gives the dish its distinctive smell and taste. The ingredients are nothing complicated and you will find most of it in your kitchen or you can easily purchase it from a store. Do try out this dish and you will be pleasantly surprised with the delicious results. 1. Pound chicken breast until it’s about ½” thick throughout. Season it with salt and pepper and set it aside. 2. In a plate combine breadcrumbs and parmesan cheese. Crack an egg into a bowl and beat it slightly. 4. Put your chicken breasts in a pan and pan fried in medium heat until browned on both sides. Drain the oil on paper towel. 5. Serve with your favorite marinara sauce. When I first saw the pictures of this dish at Nasi Lemak Lover blog I know I have to cook this. She is kind enough to share the recipe with us. She didn’t give the actual measurements to the ingredients but cook it according to her own experiences and adjust the taste to her liking. So this is my take on the dish and thanks Nasi Lemak Lover for sharing this wonderful dish. Mix all the above ingredients together except for the cornstarch for 30 minutes. Coat the chicken with the cornstarch and fry the chicken pieces with some oil until golden brown. Drain the oil and set it aside. 1. Heat up the butter, sauté the garlic, chilies and curry leaves until fragrant and lightly brown. 2. Add in fried chicken pieces and mix well. Add in sugar, salt and pepper to taste. Mix really well. 3. Add in the milk and give it a quick stir for a few seconds until the chicken absorb all the milk. Dish out and serve hot with rice. I have a love hate relationship with cilantro or coriander. Growing up, I detested this fresh herb and will throw out every piece of cilantro in my mom’s cooking. My relationship with the pungent herb only changed when I got to know Carlos. He loves this herbs and I start using it in my cooking. Over the years I learned to like it and love using it in my roast chicken. Today I used the cilantro roots for this recipe of tender and juicy grill chicken wings. You can serve it with rice or a green salad. 2. Clean and cut chicken wings into 3 sections, discard the tips and cut off excess fat and skin. 3. Marinate the wings with the blended ingredients, lemon juice, honey, salt and pepper for at least 2 hours or even overnight to developed more flavor. 4. Preheat oven to 400 degree F. Line the baking pan with aluminum foil. Place the chicken on the pan and roast the wings until golden brown. Turn the chicken half way through the baking for even browning. 5. You could crisp up the skin by broiling the wings for a minute or two under the boiler. Serve with warm rice or salad. P/S I'd like to take this opportunity to wish Happy & Blessed Mother's Day to all mother's especially to my Mom in Malaysia. This is one of the traditional Chinese steam buns. I remember we used to order this when we dine at a restaurant called Esquire Kitchen in Malaysia. It’s shape and twisted to look like a flower. It’s really soft and taste extremely good when dipped into stew pork or ‘Tung Po’ meat. 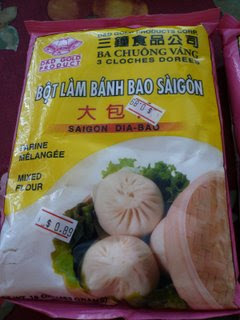 Making these buns is really easy especially with the steam buns mix that we can get from the Asian store here. 1. Prepare the dough according the package instructions. 2. Divide the dough into 12 portions. Roll out each into oval shape. Make a few cuts at the middle of the dough with a knife. Leave both ends of the dough un-cut. 3. Brush some glaze to the dough. Hold the dough at both ends, twist and shape the dough , place it on a parchment paper. Let the buns rest for 20 minutes. 4. Prepare a steamer and bring the water up to a boil. Steam the buns over high heat for 10 minutes. Serve the buns warm. I finally tried out the bread recipe of Daily Delicious . She is such a talented lady and I just love browsing through her blog looking at all her wonderful bakings. My friend Elin told me that her bread recipe always turn out moist and soft without using any bread softener or bread improver and she was right. Even Carlos who like his crusty bread said it was really good and polish off 3 of the buns at one go. For these buns I used her basic bread dough recipe and change the bread flour to whole-wheat. 1. Fit the mixer with a dough hook attachment, put the flour, salt,sugar and yeast in the mixing bowl, mix to combine. Slowly drizzle in the egg and milk mixture, work it on medium speed until the dough comes together and forms a nice ball of dough. Continue to mix for 10 minutes on medium speed. 2. Add in the butter and continue to mix until dough comes together again. 3. Put the dough into a lightly buttered bowl. Let the dough rise in a warm place until double in size. 4. Take the dough out of the bowl, deflate by touching it lightly. Cut the dough into 10 pieces, roll into a ball and let them rest for 10 minutes. 5. At this stage you can shape and put any kind of sweet or savory fillings you like. 6. Place the dough on the lined baking paper. Let it rest until the dough rise almost double in size. 7. Preheat the oven to 375 degree F. Brush the bread with egg wash. Bake for 8 minutes then reduce the temperature to 350 degree F and bake for 5 minutes or until the breads are golden brown. Flat the bread dough, place the slice sausage in the center, top it with some mix veggies, drizzle some mayo and tomato ketchup. Flatten the bread dough, roll up the sausage, make a few cut on the dough (not all the way through) then make a few twist on the dough and sprinkle some grated cheese to the top. Roll out the dough into a long strip and wrap it up around the sausage. Note : For the milk and egg measurement. Beat the egg in the measuring cup and then top it up with the milk up to get 220 grms. I rarely cook with pork as Carlos is not a fan of it but I will cook them occasionally if I get a chance to buy the pork from Chinatown. In Vietnam they will normally use fatty pork or pork ribs for this dish but I just used the lean pork I have in my freezer. This dish has a lovely sweet and savory taste that is highly addictive. You can use chicken meat for this dish too. 1. Marinate the pork with fish sauce and black pepper and set it aside for an hour. 2. Heat up about 2-3 tbsp of oil in a pan on medium high and add in the sugar. Stir from time to time and make sure the sugar does not burn. When the sugar starts to turns into a darker brown color, remove the pan from heat and add in the ginger and garlic and stir-fry for a few second. 3. Place the pan back on heat and add in the slices pork. Let the pork cook for about 1 minute and turn them around to cook the other side. The meat will have a dark golden color from the caramel. 4. The meat will discharge some juice and create a sauce with the caramel. Once that stage is reached, cover the pan and let the pork/sauce mixture simmer for about 20 minutes. 5. If the sauce dry up too fast, add about 1/4 cup of water to it and continue to simmer until the sauce thicken and the pork should dry up and caramelized. If that's not the case, increase the heat until the sauce dry up. 6. Check seasoning and add in green chilies. Serve with warm rice. Note : You can use less oil if you are using fatty pork.